After many, many months I have managed to complete the Amazon team I am painting for Kalimar. Since he has done such an awesome job creating our lovely client I wanted to do him justice with this team. 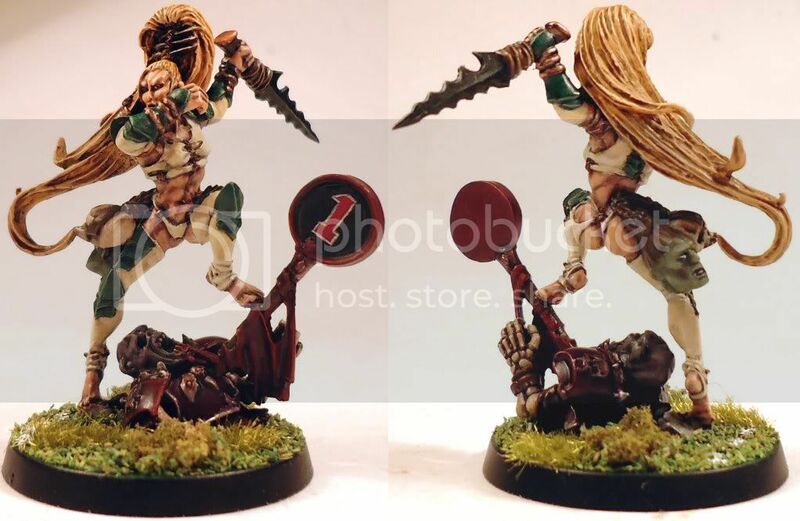 I am very proud of how they have turned out and hope I captured his preference that Amazons be savage jungle dwellers and married it to they looking like professional Bloodbowl players. 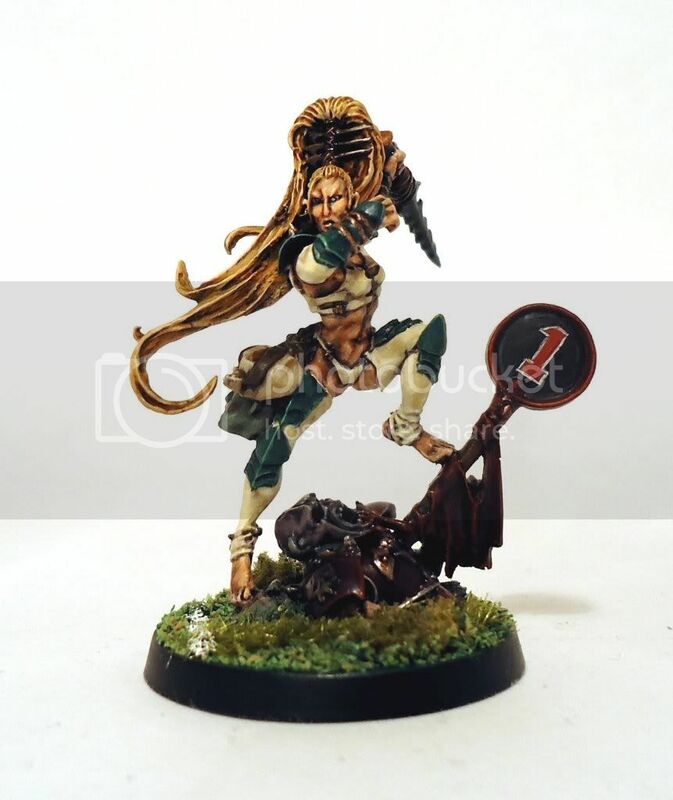 The final player to be completed was my conversion of Zara the Slayer. As she is such a lovely model and a star player I wanted to spend a bit more time on her to get the paint job just right. She has a larger 30mm base which gave me more room to add a bit of character to it with a recently slain vampire. I used Dalfort's idea of a 1st down marker in place of the eldar spear on the original model. I took this picture using a home made lightbox to try and show the detail best. Here is another pic showing her from front and back. Kalimar has asked me to take pics of all the players individually so I will do that over the next few days and add the final result when I am done. I have also been busy working on the Khemri team for the NAF championship. The test line skeleton is done, on reflection the red is a little dark and I may re-do it with a few less glazes and washes. 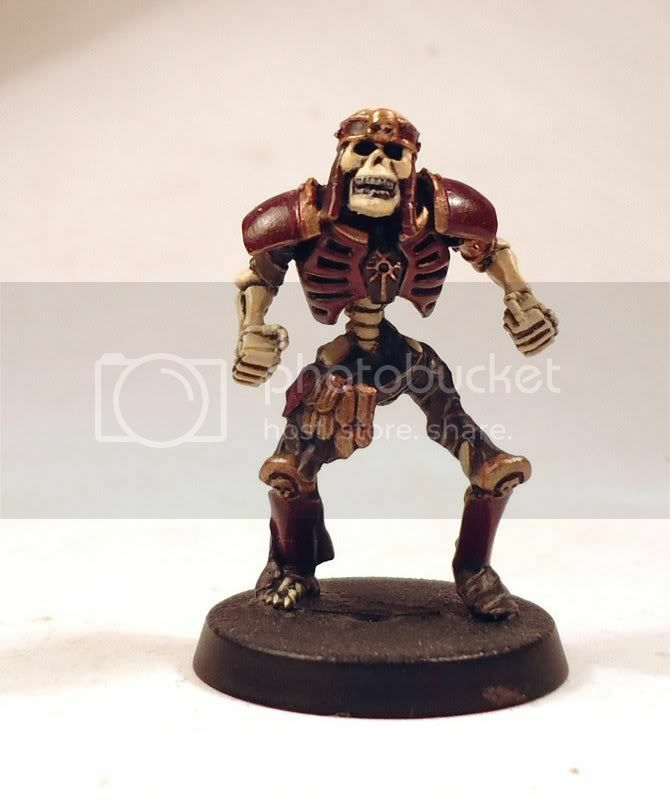 The other 7 line skeletons are fully built and I have started painting them, here are 5 of them with basic colours. I have given them all plain shoulder pads to help differentiate them from the blitz and thro-ras. I have nearly finished the 2 thro-ras as well, I finally got the last bits I needed for the 2nd thro-ra and added a collar to the 1st one. I changed my mind about the blitz-ras shoulder pads so they now have the spiked ones but haven't taken any pics of them. The aim is to get the team fully built by the end of March so that gives me all of April and half of May to paint them up. I would like to do Ramtut and Setekh for them as well as coaching staff a display base and even turn/re-roll/score markers but will concentrate on getting the team done 1st. If I have time to do the other stuff then that would be a bonus. wow, zara looks really awesome. nice job! Can't wait to hold them in my hands. You are a true artist! 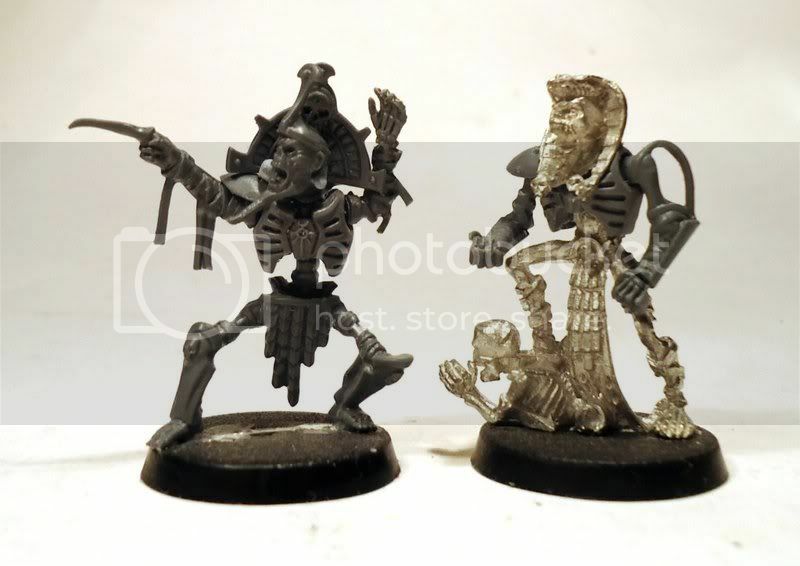 oh i am soo looking forward to the moment kalimar holds these minis in his hands!